Lead generation form ads encourage the impulse buy. With one click, you can gain access to prospect information in a way that required little time or effort on their end. The beauty of this approach for advertisers is that you can show your ads to the right audience and receive one click conversions. Paid social presents a great opportunity for one-click conversions because you’re putting yourself where you audience is already spending time. And thanks to LinkedIn’s new Lead Generation Forms the opportunity just got a lot sweeter. 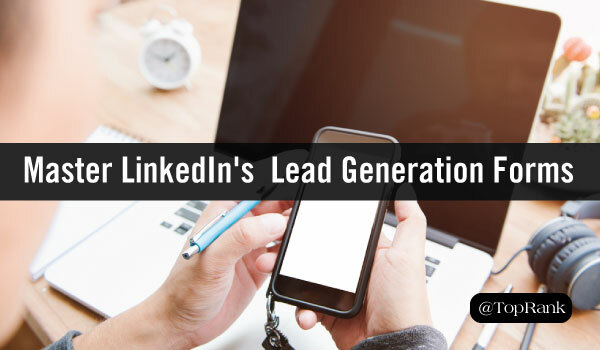 LinkedIn’s Lead Generation Forms allows advertisers to get even more high-quality leads by automatically filling in customized forms with accurate profile data. You can track campaign CPL, form fill rate, and even segment audience data by profession to get a better understanding of ad performance. This new tool makes it easier for customers to engage, and saves time by pre-filling information. With this feature, you won’t lose leads due to an exhaustive form. Another benefit is that you also have the ability to download your leads and integrate with your marketing automation or CRM software for more organized, accurate and documented lead information. If you’re ready to get started, we’ve included a helpful ten step guide below to help you create your own Lead Generation Form ad. Depending on your business objectives, you will want to select the ad type that will help you meet your goals. Advertisers can select Sponsored Content, Text Ads or Sponsored InMail for their ads. Enter a campaign name that’s relevant for the campaign and then select the language of your content and what you’d like to happen after someone clicks your ad. Then click “Next >” to proceed with the Lead Generation Forms. If you haven’t already, you’ll need to create a form template that describes your offer. Simply enter your offer headline and offer deal. Take the time to ensure that your headline and offer are compelling and speak to the needs of your target audience. As you can see, LinkedIn’s new Lead Generation Forms offer a way to make it easier for targeted audiences to convert based on your offer. By removing a barrier, these one-click conversions can help fill your customer database and encourage participation from targeted audiences. Interested in trying Lead Gen Forms? Click here to get started. Hi, I have recently created the lead gen linkedin ad for two clients, but they both are not rendering any nos. i.e reach, impressions, clicks, nothing. It continuously shows zero since two weeks. And there is no support to reach them out with this particular problem.